There are numerous reasons why this might be the case, but some of the blame can laid at the feet of the numerous myths and misconceptions that surround the world of recruiting. Though we’ll be placing our focus on five myths in particular, there are plenty more out there, many of which warp our views of recruitment marketing and make it difficult for recruiters to do their jobs effectively. Our first myth is one of the most pervasive in and out of the world of talent acquisition. Popular wisdom holds that the appropriate time to put out marketing recruitment ads is when you’re actively seeking to a hire a new employee for a particular position. In reality, the most effective recruiters are constantly working to improve their talent pipelines through effective employer brand communication. By building awareness of your employer brand and communicating your employee value proposition (EVP) even when you don’t have a specific role that needs to be filled, you save yourself the trouble of starting the talent acquisition process from scratch each time. Instead of encountering your company’s brand for the first time when you’re actively seeking applicants, potential new hires will have already seen your messaging in the past, and may even have been waiting for a position to open up. One of the primary reasons that the myth above has remained so pervasive is that it is supported by another myth: the idea that applicants care exclusively about money and benefits. On the contrary, CareerBuilder found that two-thirds of job seekers would be willing to accept lower pay if a business had an exceptional reputation online or in the media. In the same study, more than 90% of respondents said that employer brand played at least somewhat of a role in their decision to apply for a particular job. This is why it’s crucial for your message to reach candidates early and often. That way, when it’s time to apply, they already have a sense of how well your company’s values and mission align with their own—two factors that can be just as important as salary. Depending on your industry, as many as 50-60% of applicants will drop out of your process before completing the initial application. In the past, recruiters have thought of lengthy or cumbersome application processes as an applicant’s first hurdle for proving their interest and dedication. In point of fact, it’s the opposite: the initial application is the first test that your business has to pass in order to differentiate yourselves from other companies. According to another CareerBuilder report, 78% of job seekers believe that candidate experience is a good indicator of how a company treats its employees. In an era in which high quality applicants can afford to be extremely selective in choosing who to work for, a quicker, more streamlined applicant experience gives a clear signal that you value your applicants' time—reflecting positively on your business and keeping in-demand applicants from abandoning ship. This is another misconception that’s closely related to an equally prevalent myth: that the best candidates will find your job listings wherever they are, even if they’re only posted on your website’s career page. While these principles may sometimes hold true for active job seekers, they fail to account for those who, though not actively job seeking, could be convinced to change jobs. At this point you may be thinking, “Why should I focus on those who are not actively job seeking?” Simply put, only about 20% of the workforce is actively job seeking at any given time. Meanwhile, more than 80% of workers would consider changing jobs if the right offer came around, meaning that there is always a huge swath of talent that, while not actively searching for a new workplace, would happily switch if they found an employer offering better pay, more benefits, or a stronger culture fit. Though these discontented candidates are out there, they’re unlikely to encounter ads on traditional job platforms like Indeed, and even less likely to see postings on your corporate website. To reach them with your messaging, it’s crucial to go where they are. In the smartphone era, this means social media platforms like Facebook, LinkedIn, Twitter, and others. 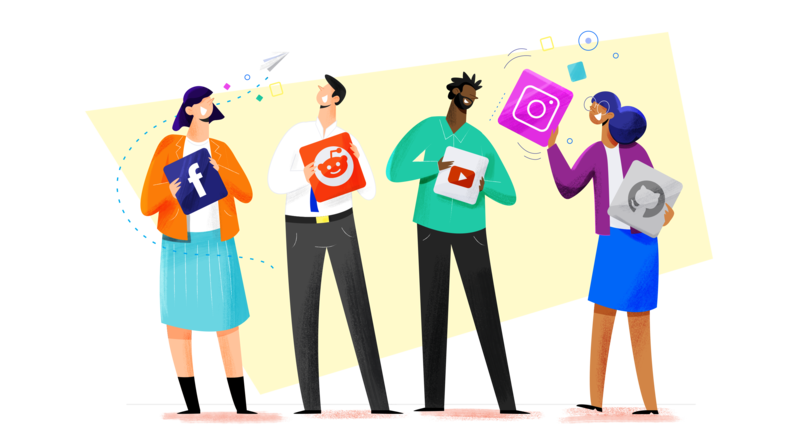 68% of American adults, for instance, use Facebook, and more than 70% of those users check the site every day, meaning that even users who not actively pursuing new employment opportunities have a chance to encounter your corporate brand there. It’s easy to adopt this mindset when you’re staring down a mountain of unread job applications, but increasing the number of applicants for a position doesn’t necessarily increase your odds of filling that position with the right person. Just because you’ve reached a large number of applicants, doesn’t mean you’ve reached the right applicants. For the same reason that traditional recruitment platforms can’t reach all of the best possible talent, ads and listings that are posted on the wrong social media platforms or targeted to the wrong demographics can lead to huge numbers of applicants who would be poor fits for your company. Of course, attracting better (rather than more) candidates is easier said than done, but carefully matching your online recruitment strategy to your industry’s prevalent demographics can go a long way.